Alaska, the 49th State, has a rich history behind it. From the Paleolithic period to the present, Alaska’s natural beauty, and its rich resources have been the land’s bane and boon to its natives. The Russians, Spanish, British, and Americans have at one time or another exploited Alaska’s otters for their fur, and the land for its oil. Alaska’s original inhabitants were of Asiatic descent. By that era, the natives of Alaska already had an organized society, which was segregated into three classes of people: the Honorables, which included the respected whalers and elders; the Commoners; and the Slaves. Their society was known to practice mummification at death just like the Egyptians. Occasionally, a slave was killed in honor of their dead, which means they also practice human sacrifice. Alaska’s discovery happened in 1741 by a Danish seafarer aboard a Russian ship. The sailors hunted the animals and took their furs back to the Old World. The people were amazed by the quality of the furs that they were sought after. Because of the demand for more furs, Alaska became a favorite hunting and trading post. Catherine the Great, who was the monarch during this period, urged the hunters to treat the Native Aleuts with compassion. However, the hunters’ obsessive quest for furs made this impossible. Alaska eventually became part of Russia and this did not sit well with the Spanish monarch, King Charles the III. Between 1774 and 1791, King Charles sent out Spanish expeditions to the area. His efforts to claim even a part of Alaska for the glory of Spain were thwarted at every opportunity by the Russian armies. Eventually, King Charles abandoned his attempts at getting a piece of the Alaskan peninsula from the Russians. He decided both the Russians and the Natives were too formidable for the Spanish. During this same period, the British also attempted to get a piece of the Alaskan territory. The possible uses of Alaska’s sea otters were too profitable for British navigators to ignore. Captain James Cook and his crew set sail to explore the Alaskan territory in 1778. When they returned to England, they showed off their beautiful fur coats that were taken from Alaska’s freshly killed otters. Upon seeing these fur coats, the British decided to send out more expeditions to Alaska. As a result, the town of Wrangell became subject to British rule. 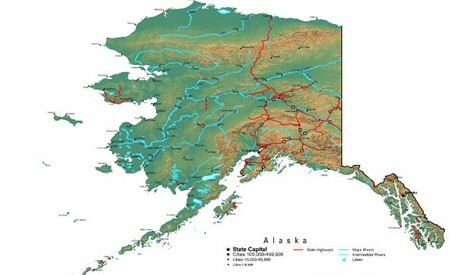 The United States purchased Alaska from the Russians for 7.2 million dollars in April 9, 1867. It did not become a state of the United States until July 7, 1958 when President Dwight D. Eisenhower signed the Alaska Statehood Act. On that day, Alaska became the 49th state of the United States of America. All through the period when Alaska was a part of America, it primarily served as a rich source of gold. Many miners, opportunists, and explorers from all over the States migrated to Alaska because of the gold rush. Eventually, they settled there and made the wintery land their home. Later, oil was discovered at Prudhoe Bay on the Arctic coast. A proposal for constructing a pipeline to distribute oil to the other states was originally denied because there was a land dispute in that area with Native Americans. Unless the dispute was settled, no pipeline would be built. The discovery of “black gold” together with the claims of Native Americans to take back the land that was originally theirs led to the signing of the Alaska Native Claims Settlement Act. The Act required the Native Americans to relinquish their claims on that particular area in exchange for 44 million acres of land in other parts of Alaska. In addition to that, they were also awarded 963 million dollars.